In 2011, he traveled from his home in Utah to California for his three older sisters (Pyper America, Daisy Clementine, and Starlie Cheyenne) to explore their modeling options. New Models LA agency signed all four siblings and he landed his first modeling job with Hedi Slimane of Saint Laurent when he was twelve-years-old. His agent suggested he dye his light brown hair to platinum blond because he needed an edgier look, which has become his signature style. Smith walked in twelve shows during 2015 Fashion Week, including Tom Ford, Fendi, and Jeremy Scott. He has been part of designer shows like Gap and Versace. He has been featured in ads for Levi’s, Adidas, Tommy Hilfiger, and H&M. He landed a Calvin Klein campaign in 2014 and a Balmain campaign in 2015. He has been named the new face of Tom Ford. 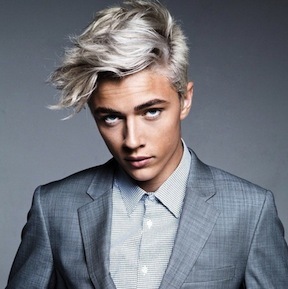 Smith also plays the drums in a band (The Atomics) he formed with his sisters when he was ten. Their parents, Dallon and Sheridan, manage their careers. Smith and his family are members of The Church of Jesus Christ of Latter-day Saints, which is often mentioned in press about him. He announced the arrival of his daughter, Gravity Blue Smith, born in July 2017 to him and his girlfriend, Stormi Henley. He starred in a “Love Everlasting," a feature film released in January 2017. This page was last edited on 6 September 2017, at 14:18.